I have recently made an article about the Apple In-Ear Headphones, so today we will be doing the Apple Earpods vs In-Ear Headphones comparison to help you decide which one to use. I have been using the Apple In-Ear headphones for more than a year now and the Apple Earpods before that. These are both awesome headphones. And like you, I am very curious as to the difference between the two before I bought my Apple In-Ear headphones. Even if you tried to read the technical specifications on the Apple website for both products, it is still difficult to know the difference unless you try them yourself. And even if you go to the store, you can’t just try them because their product packaging is sealed and they will not normally open it unless you are going to buy. So let me share with you my personal experience with both products so that you will know the difference before making a decision. Both products have totally different designs because they were made for different purposes. What I like about the Apple Earpods is that it was designed to provide more comfort with high-quality audio that can be heard from more expensive headphones. You can wear it for longer periods and still feel comfortable because it was made to geometrically fit your ear. The disadvantage of the design of the Apple Earpods is that it will not give you total sound isolation. If you are in a very noisy place, the noise will just mix up with what you are listening to. The normal reaction in this situation is to increase the volume of the portable player. Based on my experience, if you increase the volume of your device, no matter how comfortable the design, you will start feeling a little discomfort after a while because of the loud sound. The advantage of the Apple Earpods is that you have a better awareness of your surroundings even if you are listening to your music. You can still hear other people if they want to get your attention or you can easily avoid danger while using it on the streets. The design of the In-Ear is basically the same with the in-ear headphones of other brands in terms of shape except that the Apple In-Ear looks a lot more elegant. It comes with three sets of silicone ear tips (small, medium, and large). I normally use the medium size because it fits perfectly in my ear. The disadvantage of this product is that you can’t use it for a longer period. It puts a slight pressure in your ears because you have to firmly put it in. I normally use it for up to three hours, then I have to rest my ears for an hour. But that’s me. This may be on a case to case basis. Winner: In this category, the winner will depend on your preference. Both have excellent designs, but if you need total sound isolation and a peace of mind from a noisy place, the Apple In-Ear Headphones is perfect. If you need to be aware of your surroundings, you are mostly in a quiet environment, or even if you are in a noisy environment and it’s okay to hear the noise around you while listening, the Apple Earpods fits you. What is cool about the Apple Earpod’s bass tones is that it is richer and deeper. After I bought the Apple In-Ear headphones, I admit that I really missed the level of richness and deepness of the bass tones of the Apple Earpods. It feels like the bass tones in the Apple Earpods is probably reduced by about 20% in the in-ear type. You will not actually feel the difference if you just constantly use the in-ear type after you switched. What I like about the bass tones of the Apple In-Ear is that it is still a lot deeper and richer than the bass tones of the other in-ear products that I bought, like Philips. When I bought the in-ear type of Philips with a price that is almost the same with the Apple Earpods, it was a total mistake. The gap between the sound quality is really huge. But with the Apple In-Ear headphones, I did not feel that way. For me, the sound isolation and the peace of mind that it provides me when I don’t want to hear the world and still hear good quality bass tones is still worth it. Both headphones are not sweat and water resistant. The Apple website claims that the Apple Earpods provides greater protection from sweat and water. There is no specific claim for greater protection for the Apple In-Ear, therefore, we can safely say that the Apple Earpods is a little better in this category and the in-ear type is definitely not fit to be used during a workout if you sweat too much. Another cool thing about the Apple Earpods is that it is priced at only $29 on the Apple website (see discounted price on Amazon) while the Apple In-Ear is priced at $79. The in-ear type is priced more than twice the Apple Earpods and that’s a huge difference in price considering there is a decrease in the deepness and richness of the bass tones in the in-ear type. In order to save on the In-Ear type, you can try other online retail stores which offer a much lower price. For example, you can get it on Amazon at a discounted price. The remote buttons functionalities are the same. Both headphones have the same 1 year warranty period. The cable length is the same, not too long and not too short when you put your device in your pocket. The cable texture is the same and still prone to getting tangled. The frequency response is the same which is from 55Hz to 21kHz. Both headphones can be used with devices other than Apple products. I was able to use both for watching movies in more than five different laptop models. With the use of an audio extension cord, I was also able to use both to watch something in a 32″ LG TV. I was able to use both headphones in other phone brands like Samsung, Sony, and HTC. Both works fine and the sound level is the same. The Apple Earpod has an impedance of 45 Ohms while the Apple In-Ear only has 23 Ohms. This means that the Apple In-Ear will provide a higher sound level with equipment with low amplification like portable music players as compared to the Apple Earpod. According to some websites, if the impedance is above 32 Ohms, there will already be a decrease in sound level. In my experience, there is not much difference in sound level when I use it in other phones. With a very small difference between the 45 Ohms and 32 Ohms, you probably won’t recognize the difference. If you are like me who frequently needs to be isolated from the noise around in order to concentrate on something or if you feel that the peace of mind it can provide is worth more than the slight decrease in the richness of the bass tones, get the Apple In-Ear Headphones. If you prefer a cheaper headphone, better bass tones, and better awareness of your surroundings, get the Apple Earpods. 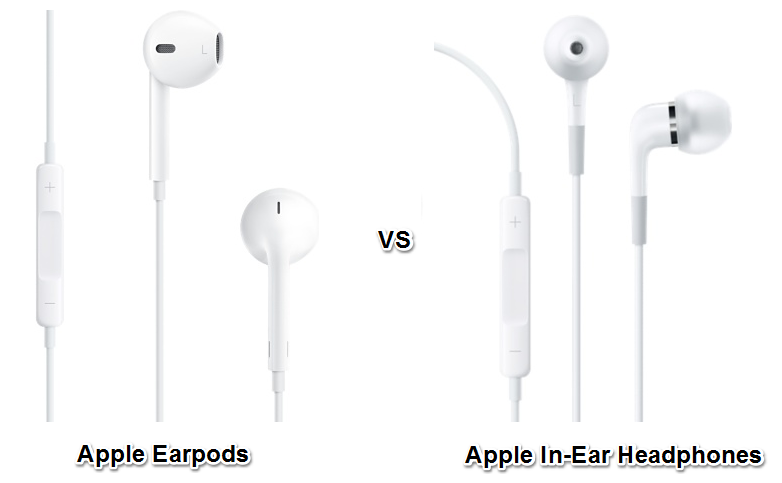 Awesome Information sharing your post Apple Earpods vs In-Ear Headphones – Which One is Better? I am extremely upbeat to peruse this post.. a debt of gratitude is in order for giving us experience info.Fantastic pleasant. I value this post. Nice review mate! Easily understandable and covers the areas that we are really interested in. Looking forward to reading more product reviews from you.